The famous grilled cheese sandwich. The most classic American dish known to man. But what’s a grilled cheese sandwich without a side of tomato soup to dip it in? I’m not about to find out. To celebrate Grilled Cheese Sandwich Day, we’ve locked in the perfect grilled cheese recipe and the most delicious roasted tomato soup. This is by far my favorite soup to make. The moment I fell in love with the bread bowl soup at Panera there was no going back. I learned how to make this soup and served it at home in a bread bowl! The difference when I bake the bread is I love to make a garlic ghee sauce and brush it all over it. You can sprinkle parmesan cheese if you like it with a bit of a crust. Then I pop it in the oven and let it bake for about 8 to 10 minutes. Start by preheating your oven to 400 degrees. In a large baking sheet add the tomatoes, garlic, and onion. Now, the original recipe calls for olive oil but I used Kelapo Ghee. Melt about 2 tablespoons of the ghee and drizzle all over the tomatoes, onions, and garlic. Make sure everything is completely coated. Next, sprinkle the salt and pepper and using your hands, toss it all together on the baking sheet. If you need to add more ghee, that’s fine. An extra tablespoon should suffice. Then pop in the oven to roast for about 30 to 40 minutes, or until the tomatoes and onions have completely caramelized and softened. Once they’re finished, place in a heavy-bottomed pot and add the chicken stock, thyme, sugar, and Kelapo Ghee. Stir everything together and turn the stove on high heat to bring to a boil. Once it’s boiling, reduce the heat to a simmer and cook uncovered while stirring occasionally. DO this for about 20 to 22 minutes. Next, add in the heavy cream, and using an immersion blender, blend everything together. If you do not have an immersion blender, use a regular blender and blend until the consistency of the soup is silky and smooth. Then place the soup back in the pot and continue to simmer for another 10 to 12 minutes, or until thickened consistency. Serve once cooled. Now the secret to the perfect grilled cheese is to grate your cheese! Also, adding Colby jack cheese is my secret ingredient when making my famous grilled cheese. Spread the Kelapo Ghee on one side of each of the bread slices. Then in a skillet on medium-low heat place the Kelapo Ghee side on the skillet. Drizzle the grated cheese on the bread slice but make sure it stays in the middle. Once the cheese melts it will spread to the edges. Then place the other bread slice with the ghee side facing up. Then using a spatula or a press, press down on your grilled cheese. Once the bread has browned a bit, flip it to the other side so it can get browned as well. Last, plate your grilled cheese, cut in half and dip into your roasted tomato soup! 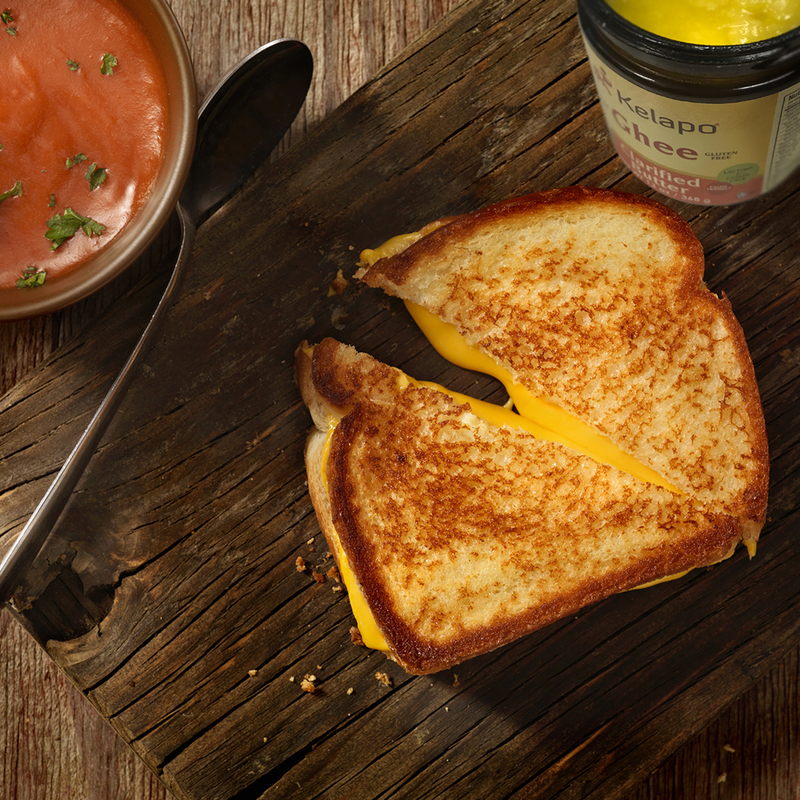 Share how you make the perfect grilled cheese in the comment below!